30% more glue from a glue stick ! Why use 15mm glue sticks, is there an advantage over 12mm glue sticks? Simple answer, yes. 15mm glue guns and sticks offer a range of advantages over 12mm glue sticks, including achieving an increased output of 30% more molten glue per trigger pull, and holding up to 60% more glue. Which means you do not need to reload as often as you would with a standard 12mm glue stick. When you need glue fast think Tecbond 15mm. Tecbond 15mm adhesives are ideal for high output applications where demand for adhesive is high and the glue is needed quickly for applications such as, packaging, carton closing, tray forming, print finishing, point of sale and tile display boards. Tecbond 15mm high performance adhesives also covers off bonding of difficult substrates such as aluminium, PVC, ABS, polypropylene, steel, glass and nylon – complete problem solving adhesives. We also offer 15mm glue sticks in Low Melt and a range of polyamide grades were increased heat & chemical resistance is required. 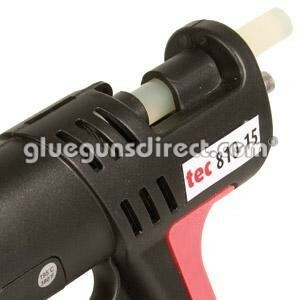 Our range of Tec 15mm glue guns – Tec 805 / Tec 810 and Tec 820 – all offer a thin profile gun body with extended nozzle tip to improve visibility, allowing accurate glue placement and adjustable full-hand lever trigger and soft-feel grip for optimum comfort. All tools have a highly efficient melt chamber giving a fast heat-up time of only 2-3 minutes. Tecbond 15mm glue sticks deliver an amazing 30% more glue than a standard 12mm glue stick. Powered via the Tec 15mm glue gun. Tecbond 15mm glue sticks are ideal for high output applications where demand for adhesive is high and the glue is needed quickly in packaging, carton closing, tray forming, print finishing, point of sale, tile display boards.